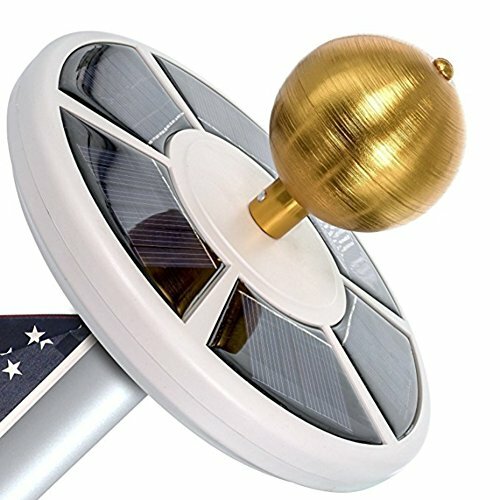 Our 42 Super Bright LEDs solar flag pole is specifically designed for the illumination of flag poles or exterior scenes throughout the evening hours, which can work up to 10 hours at night after a full sunny day of charging.The LED bulbs of flag pole light are selected for their brilliance and durability which provide you safer and brighter lighting. 3、Unscrew the ornament from the top of your flagpole. ✔ Only Solar Flag Light here. No flagpole, accessories, ornament, or flag is included. ✔ Solar light comes with carabiner, which can be hung as a night light. This solar lights has multipurpose not only for flag pole but for outdoor camping tent, patio garden, roadside or night market. 1. Remove the film on the solar panel and push the switch to ON before using. 2.Please keep the solar panel clean and locate where it can get sunlight maximum. 3. Be sure to turn the light 'ON' via the ON/OFF button before installation. MORE PHOTOVOLTAIC CELLS - To transformed more solar energy into electricity that be stored for showtime. FITTING FOR MOST OF FLAGPOLES（Through hole for 0.55in）- Thanks to independent solar charging system, there is No hassling with wires and electrical connections. Easy to install, no special tools required. Automatically turns on at night and turns off when daylight returns- Be sure to turn the light 'ON' via the ON/OFF button before installation. Face the solar panel down, if light, it's ON. If not, please turn it on by pressing it. SOLAR LIGHTS FOR FLAGE POLES - Built-in 2200mAh large capacity rechargeable battery (a 18650 3.7V Rechargeable Li-ion Batteries)for 42 brighter energy efficient bulbs,working time up to 10 hours at night after a full sunny day of charge.Eco-friendly, energy-saving. If you have any questions about this product by KINHOO, contact us by completing and submitting the form below. If you are looking for a specif part number, please include it with your message.